In preparation for the anticipated winter weather forcast, the State Police and AAA Western and Central NY encourage motorists to exercise due care when traveling. The State Police will be out across the region checking all major routes of travel to ensure that motorists are as safe as possible. The State Police need your assistance to make this possible. Motorists traveling in areas impacted by the snow are asked to leave with extra time to make a slow and careful drive to your destination. Take into consideration snow accumulation on the roads, the current snowfall rate, the wind, and visibility. Use your best judgment to determine if driving is prudent. Get the latest weather forecast before leaving with your local weather apps, monitor radio or TV stations. If you do not absolutely have to go out on the roads, then don’t. About 46 percent of crashes involving bad weather take place in the winter, making this the worst time of year for driving in treacherous conditions. Top three winter driving tips: go slow, increase space between yourself and other vehicles, and brake smoothly – don’t brake and turn at the same time. Instead brake, then turn. Obey all travel bans issued by authorities. If you do go out, is your vehicle prepared? If you should become stranded on the Thruway or any Roadway, know your location by being aware of your direction and mile post marker. This will help emergency personnel reach your location as quick as possible. 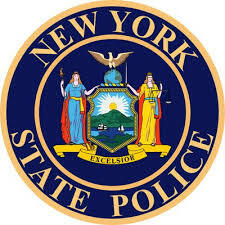 Follow the New York State Police's Twitter page @nyspolice for up to the minute information on road closures and weather alerts. The Thruway Authority provides a wide variety of information for travelers including current traffic conditions, accidents, and lane closures. Visit www.thruway.ny.gov for more information. Slow down. Be prepared. Be safe.